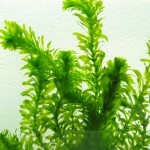 This water grass is the answer to green water. 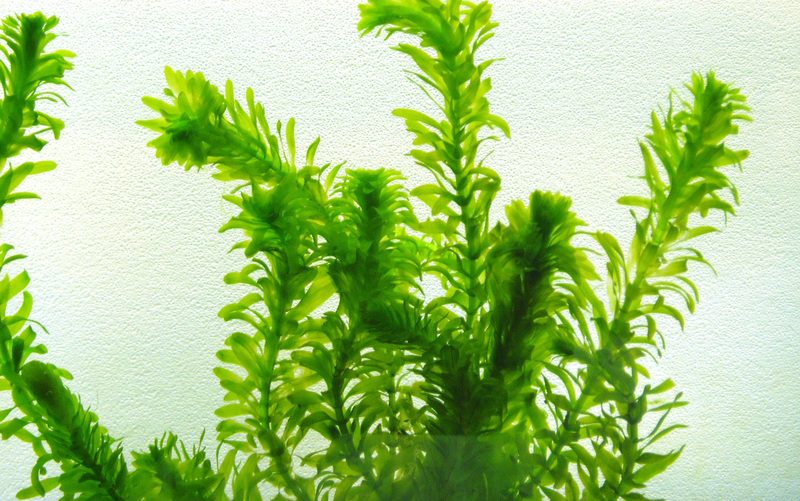 It grows on the same nutrients that algae grows on and thus through competition for those nutrients it will clear your water of “going green”. 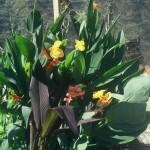 Planted within lily plantings. 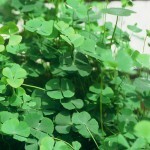 Grows in soft looking, dense “mats” of bright green foliage and dotted with clusters of blue or pink flowers. 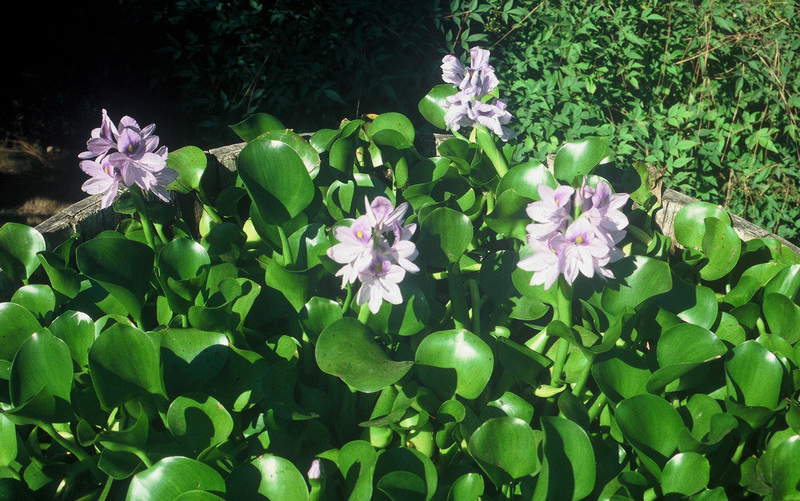 It grows particularly well in waterfalls, streams or near moving water since the roots appreciate the oxygen from the aerated water. Full to partial sun. Wonderful accent plant with a “creeping” habit, it works well to grow under taller more vertical plants, softening the edges of plant containers, waterfall rocks, etc. 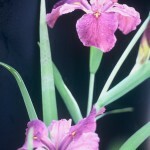 An added bonus is green foliage early in spring and late into the fall. Grows and spreads quickly. 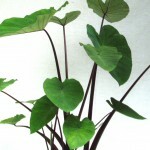 Cute, round leaves are less than 2” in diameter. 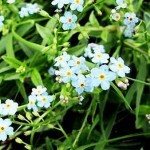 Flowers are small, subtle tufts of white or green. Full to partial sun. 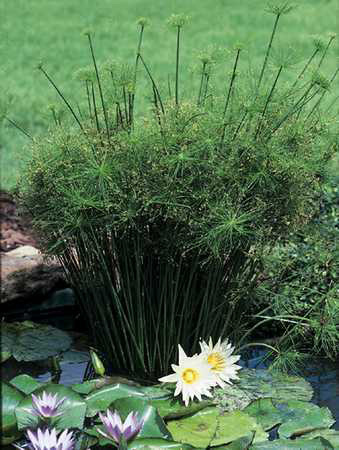 Longtime favorite watergarden plant that creates a fine, “feathery” accent for other plantings or just a great stand alone look. 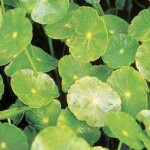 Whorls of leaves may be up to 3” in diameter, growing on long, trailing stems. Regular pinching or pruning will create tighter more attractive, dense foliage. Full to partial sun. 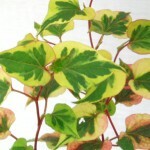 Colorful green, yellow and pink leaves make this a colorful addition to your water garden. Beautiful, small (max. 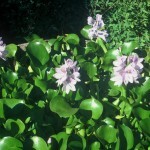 3”) leaves that float directly on the surface making this plant great for surface coverage, even in shady ponds! 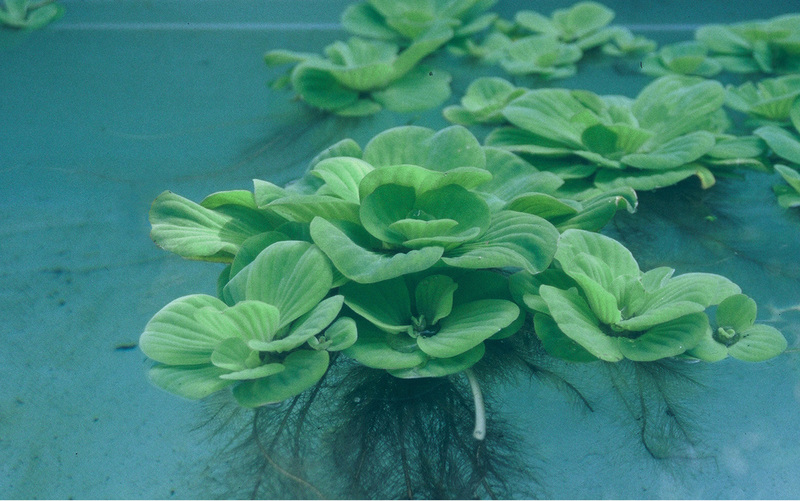 This plant is actually an aquatic fern that reproduces via spores. 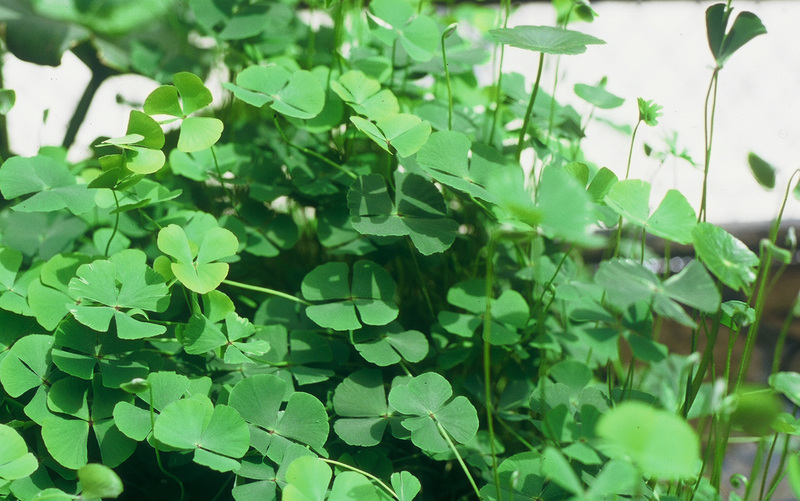 Easy to grow, very adaptive and sure to add a “lucky charm” to any water garden. Full sun to shade. 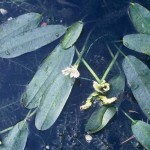 This plant “sprawls” across the water surface, sending up vertical stems less than 10” high, of bright green leaves and yellow “butter-cup” type flowers. 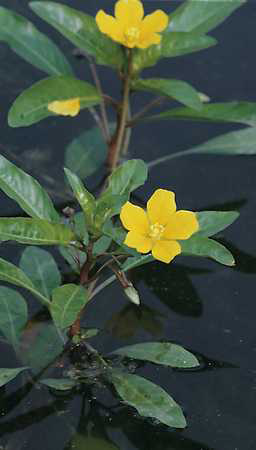 It grows quickly so frequent “pinching” or pruning may be needed to contol this plants “exuberance.” Full to partial sun. 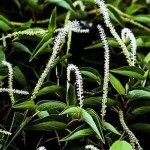 Beautiful , somewhat compact plant with narrow bright green leaves, described as being shaped like a “tongue depressor.” Flowers are small, white, and formed in pretty clusters. 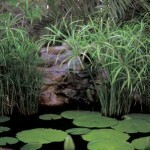 Perfectly suitable for tub or container ponds. 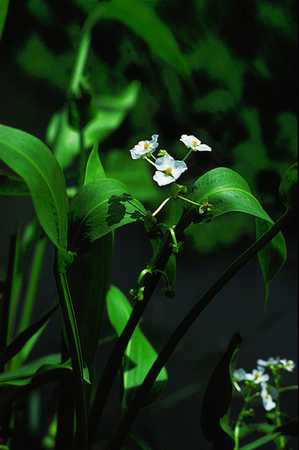 Sagittaria has somewhat of a “running “ habit and should be transplanted at least every two seasons. Full to partial sun. 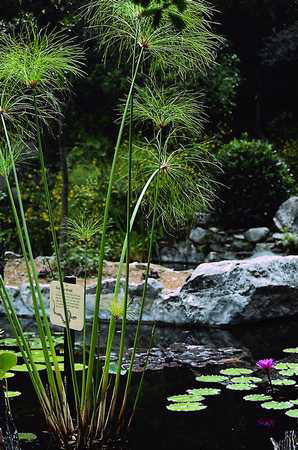 Shiny bright green, heart-shaped leaves with multiple spikes of blue flower clusters combine to create a beautiful plant that is a standard of water garden ponds everywhere. 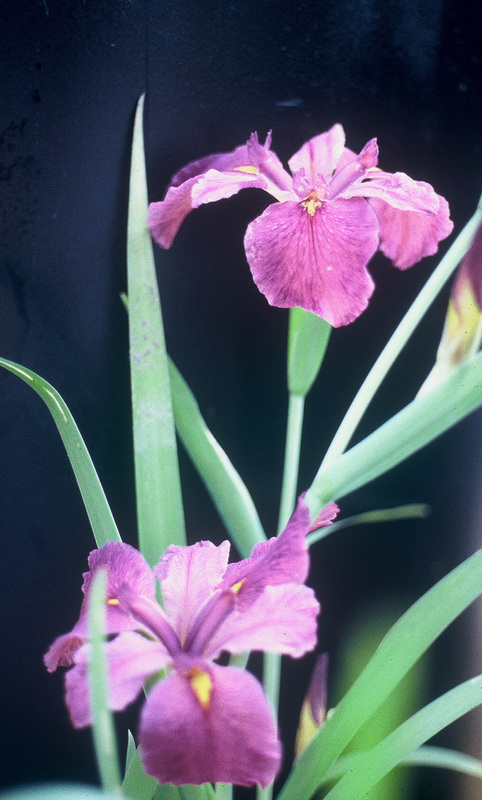 Grows very quickly and easily will outgrow normal plant containers in a season, so annual transplanting is advised for best results. Full to partial sun. Tall evergreen foliage with leaves standing upwards to 3 feet. Vibrant palette of colors blooming in springtime for duration of one month each year. Wonderful, somewhat taller bog plant sporting interesting white blooms above the foliage for several weeks in the summer. Full to partial sun. 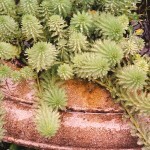 Stems on this plant are topped with a “sprout” of leaves that may reach 24” across on larger, mature specemins forming the namesake “umbrella”. These leaf clusters are viviparous and may form small plantlets. Full to partial sun. 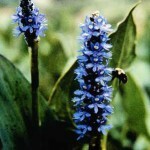 Distinct plant that has a quick easy growing nature and compact size that have made this a favorite for many years. The soft looking tight tufts of green and brown form on each of its many stems providing great accent to broader-leaf plants. Full to partial sun. A large plant that can attain mature heights exceeding 10 ft. when growing unrestricted in its native climates, it is unlikely to exceed 4 ft. in our backyard enviroments. The seed heads are large, feathery and showy. Full to partial sun. 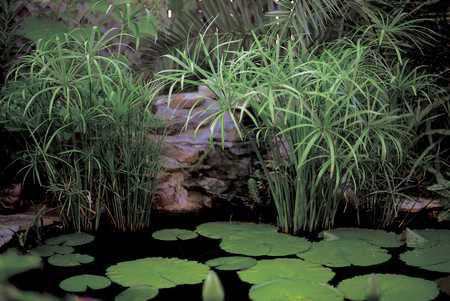 Violet Stem Taro with its rich dark stems and solid green leaves shaped like broad arrowheads is a dramatic addition to any pond. 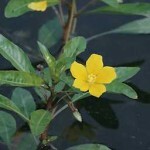 Grows well in moderate climates. Height between 3 – 7 feet. Many varieties available. 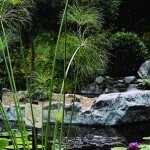 Will grow to a full and tall size to fill a planting area along the edge of a water feature. The Natural filter; removing harmful heavy metals and other impurities. Floating on the surface, it does all the work through its hanging roots. 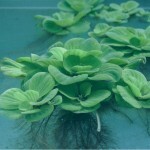 Another floating plant that takes on the appearance of a small head of lettuce. 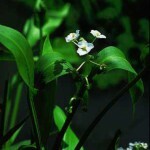 Elongated floating leaves with white, vanilla sented , dellicate flowers. 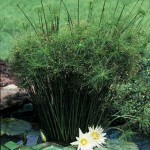 Grows from a small bulb rooted in soil in shallow water under depth of under 14″ deep. Thrives in cool moving waters.